Akos from the RTLSDR4Everyone blog has recently uploaded four new articles. The first article reviews the new FlightAware Prostick Plus. 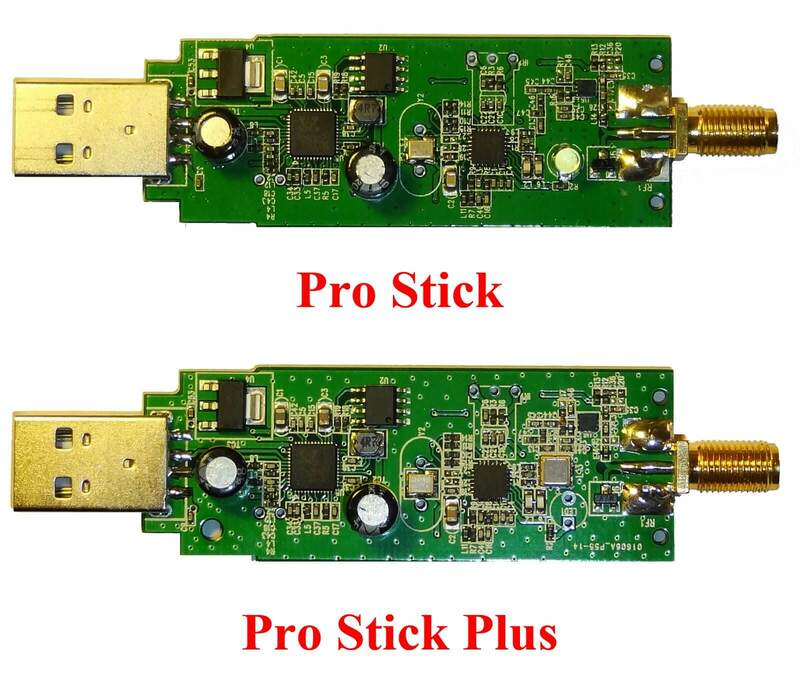 The Prostick Plus is an RTL-SDR dongle optimized for ADS-B reception. It contains a LNA and 1090 MHz filter on board the dongle. In his review Akos tests the FlightAware Prostick Plus and compares it against the regular Prostick with external filtering. His results show that the Prostick Plus gets 18.45% more position reports and 5.4% extra max range in his location. His second post continues with the Prostick topic and warns customers to look out for sellers reselling, or relisting the Prostick for much higher ripoff prices. In his third post Akos reviews our RTL-SDR.com broadcast FM filter and compares it against another similar filter from another seller. His test results show that both filters can improve performace. Two BCFM band stop filters tested by Akos. Finally in his fourth post Akos writes a tutorial on getting started with Outernet reception. He bought the full Outernet bundle which comes with a battery bank, CHIP single board computer, E4000 with bias tee RTL-SDR, LNA with filter and patch antenna. His post describes what each component is, then shows how to use them to receive Outernet. His results also seemed to show that our V3 dongle significantly outperformed the E4000 dongle at Outernet reception. The V3 received the Outernet signal with a SNR of 6.39 dB vs only 2.58 dB with the E4000. Outernet is a new satellite service that aims to be a free “library in the sky”. They continuously broadcast services such as news, weather, videos and other files from satellites. Their aim is to provide up to date information to users in locations with little to no internet (rural, third world and sea), or in countries with censored internet. It may also be of interest to disaster preppers. Currently they have an active Ku (12 – 18 GHz, though due to be discontinued shortly) and C-band (4 – 8 GHz) satellite service, and now recently have their L-band (1.5 GHz) service active. The L-band signal is currently broadcasting at 1539.8725 MHz over the Americas, 1545.525 MHz over Europe/Africa/India and 1545.9525 MHz over Asia/Pacific. To receive their L-Band service you will need an RTL-SDR capable of receiving 1.5 GHz, like a R820T/2 RTL-SDR (preferably at least passively cooled like our RTL-SDR Blog models as some R820T/2 units tend to fail at 1.5 GHz without cooling) or an E4000 dongle. You will also need an appropriate L-Band antenna and L-Band amplifier. To help with these hardware requirements, Outernet have just released for sale an E4000 RTL-SDR with bias tee enabled ($39), an L-band satellite patch antenna ($24) and an L-Band LNA ($19). There is also a E4000 + LNA bundle ($49) available. The E4000 comes in a metal case, and has the bias tee always on. 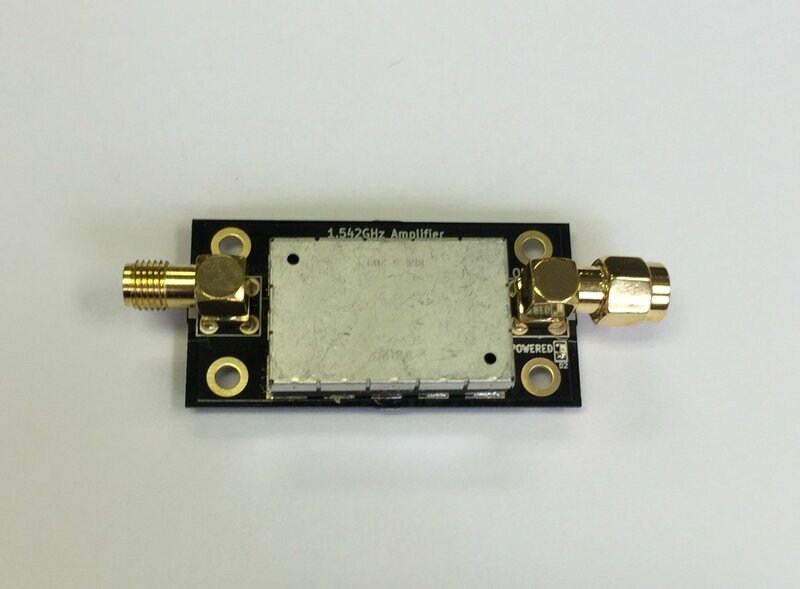 The LNA requires bias tee power and is also compatible with our RTL-SDR Blog units that have the bias tee. 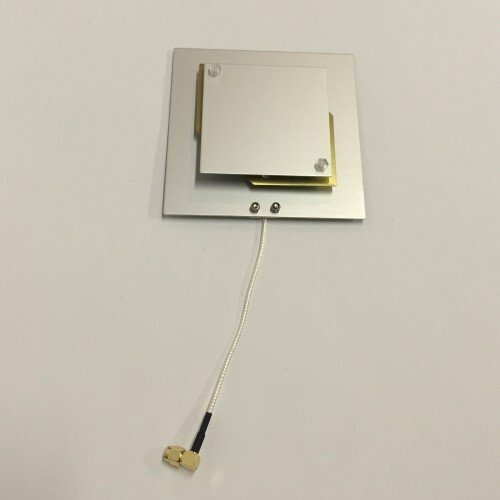 The patch antenna is tuned for 1525 – 1559 MHz and is the production version of the prototype antenna we used in our Inmarsat STD-C tutorial. Combined with an LNA we found that the patch antenna gives good performance and can also be used to receive other services such as Inmarsat STD-C and AERO. Currently shipping is only available within the USA, but they write that they will have international shipping available shortly. EDIT: For international buyers the Outernet store is now started selling these products at http://store.outernet.is. The L-Band Outernet signal decoders aren’t finalized yet, but we expect them to be released in a matter of days to weeks. They will have decoders available for the $9 CHIP computer and Raspberry Pi 3 platforms. They way it works is that you plug your RTL-SDR with L-band LNA and patch antenna connected into the CHIP or Raspberry Pi 3 which is running their customized image. 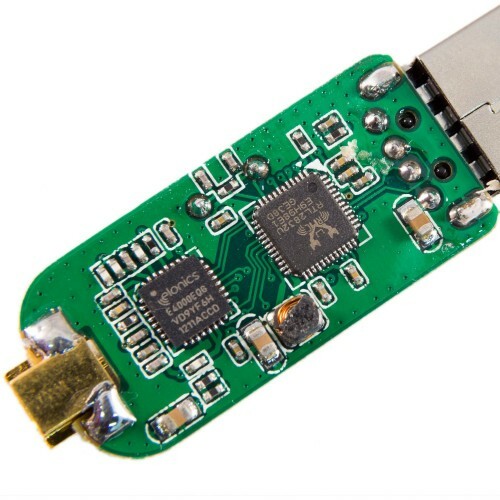 The CHIP/Pi3 then broadcasts a WiFi access point which you can then connect to with any device, and access the files as they are downloaded. Once these decoders are released we’ll do a full tutorial on receiving the Outernet L-Band service with an RTL-SDR. 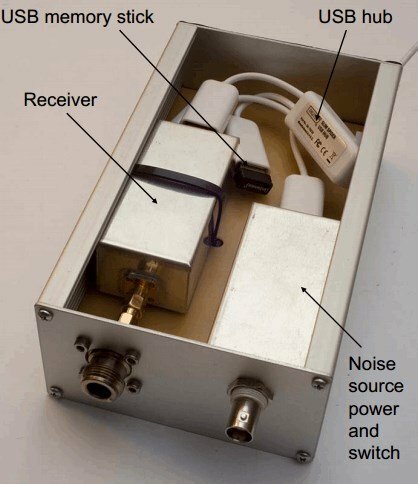 The Outernet E4000 RTL-SDR in metal case with bias tee. 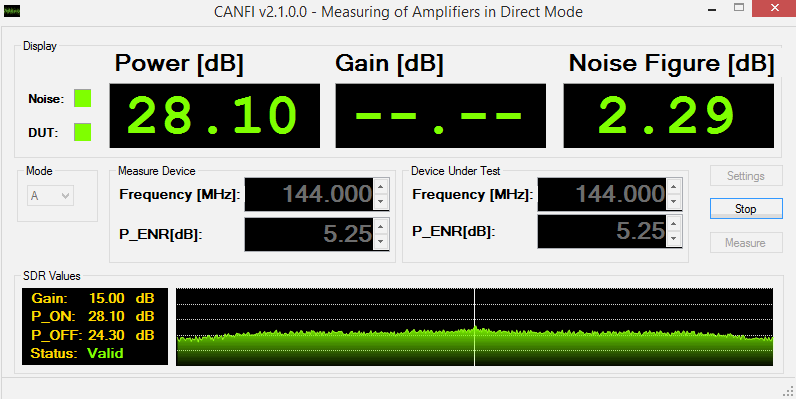 Over on Avian’s blog author Tomaz has posted about some noise figure measurements he has done with an E4000 RTL-SDR dongle. To do the measurements he used a vector signal generator and used the “Y-factor” and “twice-power” measurement methods with the output measured in GNU Radio. In his results Tomaz saw some odd peculiarities as the twice-power and Y-factor measurements disagreed, coming out with noise figure values of 17.0 dB and 13.6 dB’s respectively. He isn’t sure what could be causing this disagreement but speculates that there must be some sort of physical process within the dongle causing these differences. He was also concerned about the larger than expected noise figure values, since the E4000 datasheet specifies a noise figure of 4 dB, though he points out that these datasheet values may be best case values only. Measuring the noise figure of an E4000 RTL-SDR with a vector signal generator. The programmer of Linrad (aka Leif sm5bsz) has uploaded a video to YouTube that compares several software defined radios on dynamic range and compression performance in the presence of strong nearby signals. In the video Leif tests the Airspy, BladeRF with B200, FDM-S1, Funcube Pro+, rtlsdr/E4000, rtlsdr/FC0013, rtlsdr/R820T, SDR-14 and SDRplay. The main test works by tuning to a broadcast band FM frequency and then injecting a strong carrier signal at distances of 500 kHz, 1 MHz, 2 MHz and 5 MHz from the center frequency. The carrier signal strength is slowly increased until the SDR shows signs of complete degradation of reception of the FM signal. Better SDRs will tolerate stronger nearby signals without degradation. The results are summarized at 34:20, 1:21:38 and 1:48:30. We have also taken screencaps of the results at 1:21:38 and 1:48:30 and they are shown below. The first column is when a higher gain is used, and the second column is when a lower but still barely copyable gain level is used. In the Levels for loss of performance columns smaller numbers are better and in the Dynamic range columns larger numbers are better. Finally, at the end of the video starting at 1:45:55 Leif also tests the spur performance of the SDRs. The online store Nooelec has recently started selling two new RTL-SDR related products. 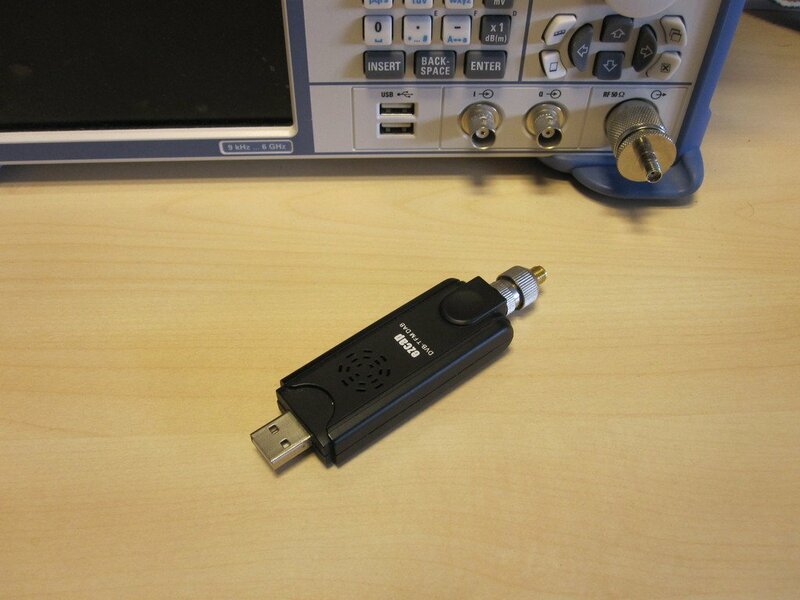 The first product is a lower cost RTL-SDR dongle with the E4000 tuner (ebay). The E4000 tuner was one of the original tuner chips used in RTL-SDR dongles when they were first discovered. Unfortunately Elonics, the company that owned the rights to the chip went under and the production of E4000 chips stopped, making them rare and expensive. The E4000 tuner has a tuning range of approximately 55 MHz – 2300 MHz, compared to the R820T tuner which has a range of around 24 – 1766 MHz. The cheaper R820T is better in most cases, but if you need the higher frequencies the E4000 may be an option. The new E4000 dongle is currently selling for around $50 USD, compared to the other E4000 models which went for around $100 USD. 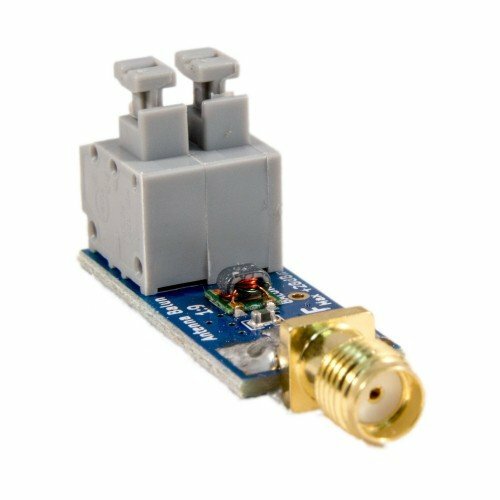 They have also begun selling a low cost 9:1 balun for about $10 USD (ebay) which can be used with a long wire (or random wire) antenna when receiving HF on the RTL-SDR with an upconverter. The impedance of a long wire antenna is approximately 450 Ohms (very approximate, impedance varies with frequency and length). A 9:1 balun allows a match with a 50 Ohm receiver, which is close enough to the 75 Ohm input of the RTL-SDR. Amateur radio hobbyists Frank Schmaling (DL2ALF), Wolf-Henning Rech (DF9IC) and Alexander Kurpiers (DL8AAU) have uploaded a pdf document containing slides which show how they made a cheap noise figure indicator using an E4000 RTL-SDR dongle. A noise figure indicator can be used to check the noise figure of various components used in RF applications. The hardware of the device consists of an RTL-SDR, a MGZ 30889 preamp, a noise source, a 28V boost converter to power the noise source and a serial to USB converter to control the noise source. They also created their own custom software in C# to go along with the hardware. Their results showed that this setup was comparable to a professional noise figure test set. 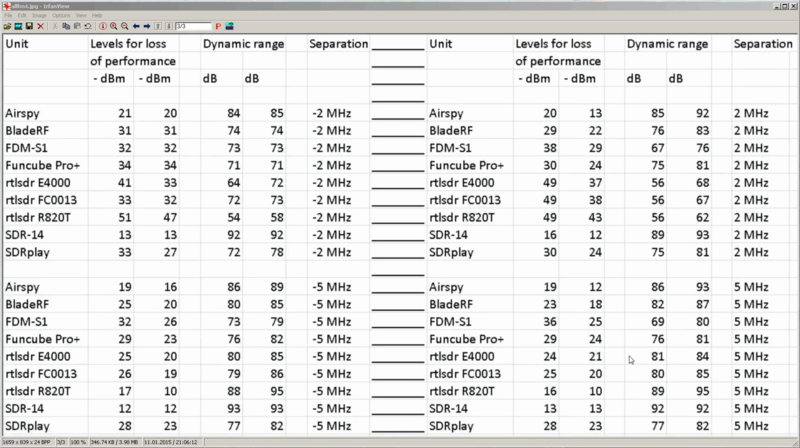 Recently a reader wrote in to correct some mistakes regarding the Linrad software on our big list of RTL-SDR supported software post. Along with those corrections this reader also wanted us to know how much of a superior receiver he believes Linrad and the special Linrad RTL2832U E4000 drivers are. If you are unaware, Linrad is an RTL-SDR supported SDR receiver program (similar to SDR#/HDSDR/SDR-RADIO) with very advanced features, but also a relatively steep learning curve. The reader who wrote in wants to remain anonymous, but we will say that as far as we can tell he is not affiliated with the development of Linrad, and is simply a Linrad user and fan. The first point the reader would like to make is about the Linrad RTL-SDR drivers special linearity mode. [The Linrad drivers] main advantage for RTL E4000 based dongles isn’t the weak signal mode. It’s actually the linearity mode that provides significant dynamic range improvements over the existing osmocom drivers (http://www.sm5bsz.com/linuxdsp/hware/rtlsdr/rtlsdr.htm). The author of Linrad, Leif, is very knowledgeable in both RF and SDR technology. It is extremely rare to be skilled in both. Leif submitted his modified RTL drivers to the osmocom team, but as best as I could tell, it became quite apparent the osmocom team does not have a firm grasp of the concept of dynamic range, and receiver performance metrics. Leif’s code was rejected for cosmetic reasons. It is a large shame, but highlights the extremely poor understanding the SDR community has of basic receiver performance metrics. Your readers should take a look at this video. Shortly after the 4 minute mark, a strong signal is introduced into all four dongles. This signal is swept across so at times it is not present in the frequency span the dongles are listening to. Two of the dongles are E4000 based RTL SDRs, and naturally the Linrad one is using properly optimized settings. Notice how the properly optimized Linrad drivers show a nice calm spectrum, free form spurs, harmonics, images and other offending signals when the signal generator is introducing a signal several MHz away from the listening frequency span. Notice how the osmocom dongles are essentially trashed, where nothing but the strongest of strong of signals could be heard, and even then it’s likely to have distortion. This is what happens in the real world. For most people, when they connect their RTL to an outdoor antenna, their receive performance is not limited by the noise figure of the dongle, but rather by its dynamic range. Leif is the _only_ SDR program author that fully understands this. Note that if you just want to try the modified Linrad E4000 drivers on SDR#, there is this modification that can help. As well as the driver issue the reader also highlights some advanced features of the Linrad SDR program itself which are not present in most other similar software defined radio programs. 1) Proper I/Q calibration. 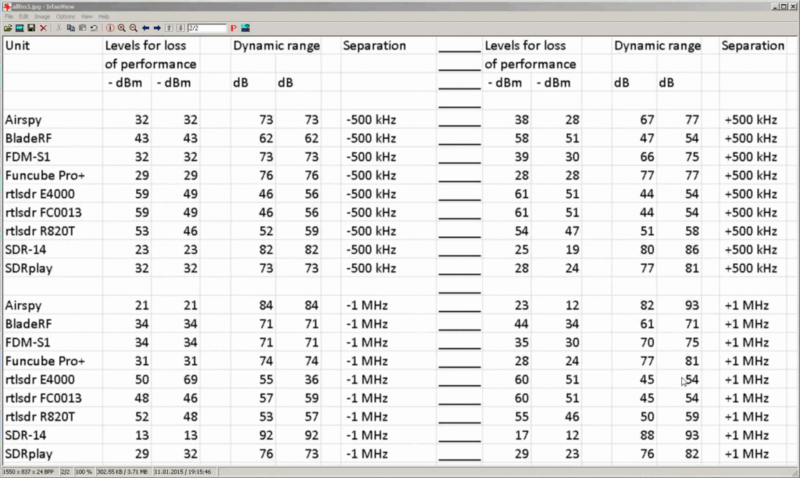 Other programs at most only allow you to calibrate a SDR for a single part of the spectrum. This is not proper, because at a few kHz away, the I/Q balance will shift and the calibration will no longer be accurate. Linrad allows you to calibrate for many frequency intervals across the SDR’s bandwidth, resulting in a flat frequency response and true I/Q phase and amplitude balance calibration. 2) Due to frequency response calibration using a pulse generator (http://www.sm5bsz.com/linuxdsp/flat/sqrpulser.htm), Linrad has a phenomenal “smart” noise blanker to remove (blank) pulse noises. Signal with no blanker http://sm5bsz.com/linuxdsp/blanker/leon2001/leo-nob.mp3. Here is the same recording, but with the “magic” of a fully calibrated Linrad blanker. http://sm5bsz.com/linuxdsp/blanker/leon2001/linleo.mp3. No other SDR software’s blanker can produce results like this. 3) Linrad can multicast its output to multiple computers or directly to a single computer over the network. You can also run multiple instances of it on the same computer. 4) Linrad’s waterfall is effortlessly optimized to display signals ~10dB (or more) weaker than what you can hear. No other SDR program allows this “out of the box”. Some will achieve similar performance by adjusting various settings, but will require more averaging (slower water fall speed) to achieve a similar waterfall “visual” SNR as Linrad. 6) Linrad supports two RF channel input for diversity reception. In short, if you want to listen to FM broadcast signals from 88-108 MHz, take your pick of SDR programs, it doesn’t matter when picking up a 50+ kW transmitter a few dozen kilometers away. If you want top performance, learn about DSP, RF, performance metrics, and so forth, there is only one suitable program: Linrad. Nothing else comes close. Last month we showed a video of a spectrum analyzer project by Stephen Ong. 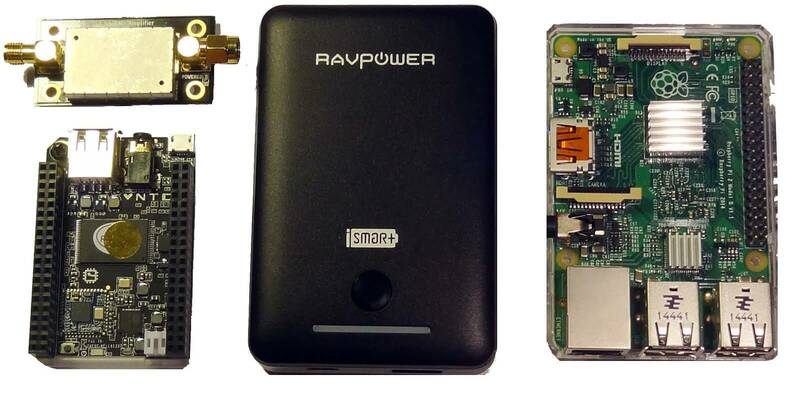 He used a BeagleBone Black (mini embedded Linux capable computer similar to a Raspberry Pi), a touch capable LCD screen, and an RTL-SDR dongle to create a portable spectrum analyzer. Now Stephen has released ‘ViewRF’, which is the software that powers his spectrum analyzer. It is released under the GPL licence. Also on his post are the download and install instructions.